The last week of August, with camp in the rearview mirror but with the first day of school still down the road a-ways, we took Zoe to Hershey Park. Though she'd been to her share of carnivals and smaller parks, this was her first BIG amusement park. I'd been to Hershey, and countless other amusement parks, as a kid and I loved roller coasters, so I was looking forward to introducing Zoe to some real rides, at least the ones she'd be tall enough to ride. And willing to go on. I knew the latter would depend on her mood. Funhouse mirrors could learn something from Zoe about distorted realities. Strap yourself in and keep your arms and legs inside the vehicle, folks, because unexpected turns are ahead. 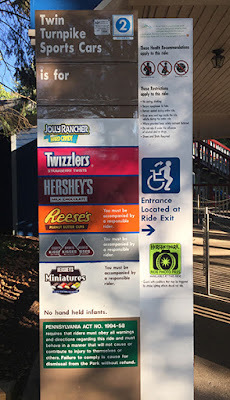 We were traveling with friends who have two kids---one older than Zoe at 8, one younger at 5---so when we arrived at Hershey Park we checked in at the measuring station to find out each child's candy (i.e., height) designation. Zoe and her five-year-old friend were both "Reese's" (aka my favorite candy, and if I'd met a Reese's Peanut Butter Cup that was more than 40 inches tall, well, I wouldn't be here talking to you now because I'd be a) still eating or b) hospitalized). 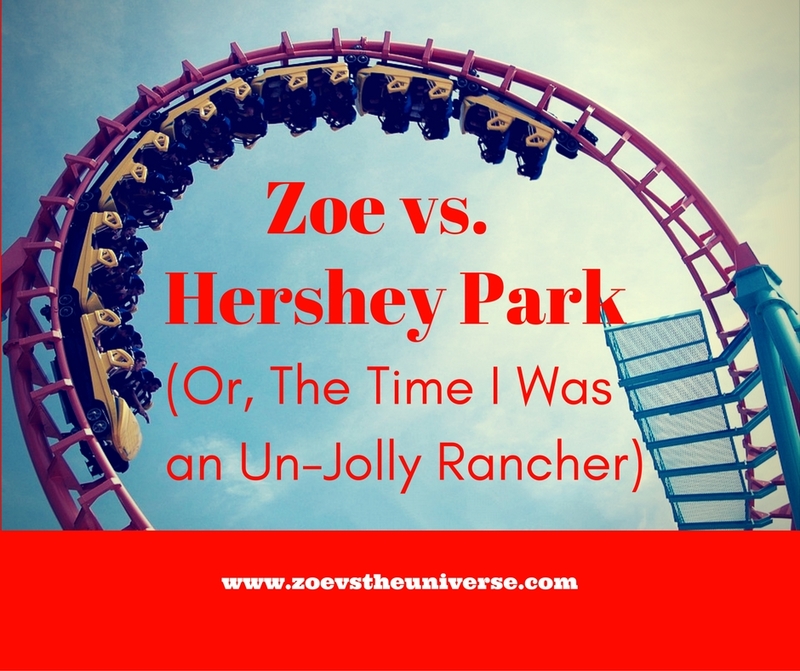 One of the first things I learned at Hershey was that Zoe's OCD was of a different flavor from mine. Every ride she went on, she had to be in the "1st" car, bumblebee, anthropomorphized jet plane or what have you, even if the ride went around in a circle. I have no idea why, but she did it every ride. When some other kid beat her to a "1" vehicle which happened to be a firetruck, I watched her regretfully belt herself into the purple muscle car next in line, marked with a "2." Another thing I learned was Zoe perversely wanted to go on rides she wasn't allowed to go on but refused to go on so-called moderate thrill rides that allowed Reese's, as long as they were accompanied by an adult. For instance, the log flume. One of the tamest rides in existence. It had one dip. She did go on once but then adamantly refused the next time. Soon we realized there was a "drama" competition going on between her and her five-year-old friend over who was more scared. They'd get off a ride and one would say, "That was the scariest ride ever." Then the other would say, "I screamed the whole ride." Next: "I'm never going on that again!" Or: "I almost throwed up all over the place." And then, after one ride, her friend said, "I almost had a heart attack." This gave Zoe pause, and she nodded once, soberly. She did not try to one-up her friend after that. Out of respect. But the biggest thing I learned was something awful about myself. I learned I may be too old for rides. It had been years since I'd been to a real amusement park and ridden a real roller coaster. I'd forgotten how rides felt, the stomach-dropping plunges, the spinning, the sudden swerving. Also: heights. Zoe wanted to go on the Flying Phoenix. Each "car" on this ride was a two-seater flimsy plane thing, open to the air in a way that suggested death and lawsuits. We got on and it went up. And then spun. Really fast. Sure, there was a seat bar, but I think it was the centripetal force that was really keeping us in the vehicle. Zoe didn't mind how high we were. We could see the whole park. Over and over. At high velocity. Did I mention a lot of the vehicle was open? I told Zoe she could close her eyes if she was scared. She said, "I'm not going to close my eyes, silly." Meanwhile Silly was sitting behind her, eyes shut tight, clutching the metal bar like it was the last Reese's Peanut Butter Cup in the world. When we finally got out of that death trap I was a decidedly Un-Jolly Rancher. Somehow I thought I'd still be able to handle a roller coaster. They'd been my favorite as a teenager. So when the chance came to take my friends' "Hershey's" size son on the Wild Cat, I went. Now, apparently, your ears change as you get older. The vestibular system of your inner ear becomes less efficient, which means you're less able to deal with abrupt changes in head position and you're more susceptible to motion sickness. Combined with that, there are the aches and pains that become familiar as you reach your forties, when it becomes common to wrench your back sneezing or sustain a neck injury due to sleep. When I got off the Wild Cat, I felt dizzy. I felt ill. My neck was sore from being jarred so violently, and . . . was that my tendonitis flaring up from how I'd held my shoulders when I was checking to make sure my glasses wouldn't fall off during one of those hard turns? Remember when you were a teenager and you could see? But I had a rep to protect, plus I didn't want Zoe to be afraid. So when following that everyone wanted to go on the Pirate ride, I went with her, and even though we had to sit in the middle, special seating for Reese's, where it was less thrilling, I told her I didn't mind at all. And would she mind if I closed my eyes? If you liked this post, you might also enjoy this. There's no height requirement . . . click here to subscribe.